Jane Eyre is the most famous female, literary orphan in English literature, but what do we know about Jane Eyre’s mother? Surprisingly, for a character who doesn’t appear in the novel and is hardly mentioned, we know a great deal. We know her name and maiden surname, how and we she died, who and why she married, a few things about her family and some significant aspects of her personality. Consequently we know that her mother’s maiden name was Reed and that her husband’s surname was Eyre. We also learn that Jane has no memories of her father, her mother or her uncle, because she was an infant when they died. Jane also tells us about the effect that the lack of loving parents or relatives affected her personality. Well before Freud identified and shared his theories regarding the conscious, subconscious, and unconscious mind, Jane Eyre was fully that her parents’ absence was affecting her moods and character were due to factors beyond her control, within her psyche. Ten year-old Jane tells Mr. Lloyd, an apothecary, called in by Mrs.
Jane describes herself as unhappy because she is missing the family she doesn’t have. A contemporary psychologist might suggest that, as an orphan, Jane was vulnerable and predisposed to physical and psychological risks such as depression and antisocial behaviour, and would probably need counselling. Instead she was plunged into an unloving household, where she was demeaned, neglected and physically and psychologically abused. There could have been many outcomes to her future personality, she could have sunk into disruptive behaviour or swam to the surface as a stronger, fiercely independent, determined and kind person. Jane Eyre found out about her parents’ death and bad relationship with her maternal grandfather, Mr. Reed, from Bessie, a servant at her aunt’s house. Bessie in turn had learnt this information from another, older servant at the house, Miss Abbot. This passage informs us that her mother married a clergyman for love, against her family’s wishes. Jane was aware that her mother valued love over social convention or economic stability. Nine years later, while Jane is working at Thornfield, she was called to visit her Aunt Reed, who was on her deathbed. Jane took the opportunity to ask her why her aunt hated her so much. Thus Jane learns that her aunt had hated her mother and that she was jealous of her husband’s affection towards the helpless baby. In summary, we know that Jane Eyre’s mother, Mrs Eyre, née Jane Reed, was beloved by her brother, Jane’s Uncle Reed, who had been a well-to-do magistrate, before his premature death. We also know she was estranged by her parents for marrying a clergyman, Mr Eyre, whom they considered was below her station. We know she married for love, that Jane was born nine months after their marriage and was a three-month old baby when her parents died, a year after marrying. Mrs Jane Reed Eyre died of typhus, a disease contracted by her husband first. We can infer that she was a passionate, independent and determined woman, who was prepared to turn her back on her family and material comforts, in order to marry the man she loved. It surprises me that Jane only mentioned missing her mother once as a ten-year-old child and never mentioned her mother as an adult. Grown up Jane seemed to have completely wiped her mother out of her thoughts, perhaps because she had no memory or image to cling to. On the other hand, we can imagine her mother’s influence in Jane’s famous quote that she’d rather be happy than dignified. It definitely seemed to have been her mother’s motto too! I’d also like to remind you that today, 31st of March, is the anniversary of Charlotte Bronte’s premature death in 1855, at the ge of 38. She was pregnant when she and her unborn child died. Her death certificate gives the cause of death as tuberculosis, but biographers, including Claire Harman, have suggested that she died from dehydration and malnutrition due to vomiting caused by severe morning sickness. Charlotte Brontë was buried in the family vault in the Church of St Michael and All Angels at Haworth in Yorkshire, UK. 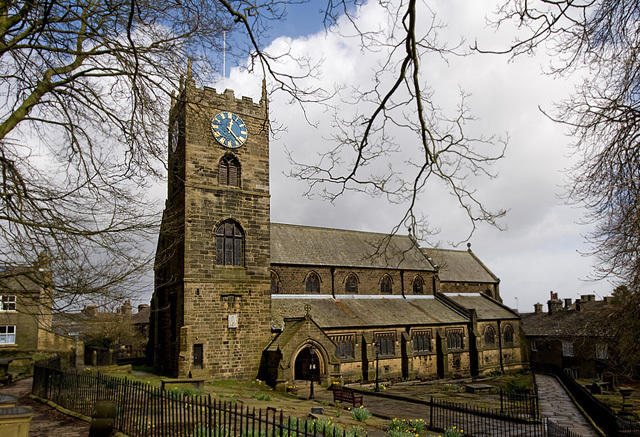 Photo by Dave Green of St Michael and All Angel’s Church, Haworth (Wikipedia). P.S. If you haven’t read Jane Eyre, you’re missing out on one of the greatest novels ever written, and it’s almost free on amazon kindle, including the audiobook! If you have read Jane Eyre, perhaps you’ve wondered what happened after Jane and Rochester married, so have I, that’s why I wrote The Eyre Hall Trilogy, on special offer at the moment. Fascinating information on one of my favorite authors! Thank you. Thank you, Cindy. I’ve spent most of my life combing through every sentence and every word of Jane Eyre! I’ve read Jane Eyre many times, but I’d forgotten just how much the audience knew about her mother. Good post. Thank you! There’s so much in Jane Eyre. Every time I reread there’s something new!